It is that magical time of year again, when our coastal waters are graced not only with the presence of the ocean’s most formidable predators, great white sharks, but also its gentlest giants – whales. These enormous sea mammals are closely related to dolphins and both are part of the cetacean family, of which around different species are found along South Africa’s shores. Some whales are only occasional visitors migrating past our coast, while others – like southern right whales – make it their home for longer periods, swimming up from colder waters at the start of winter to mate and calf in sheltered local bays. In an aerial survey carried out by the Whale Unit of the University of Pretoria’s Mammal Research Institute over 8 days in October this year, a total of 527 southern right whales were observed between Nature’s Valley on the country’s east coast and Lambert’s Bay on its west: 366 females and calves (183 pairs) and 161 independent adult whales. These numbers are not as high as in years past, but they are significantly higher than in 2016, when only 119 southern right whales (including all females, calves and adults travelling alone). Over the next few months, a series of 6800 photographs taken during the survey will be analysed via photo identification and image recognition software. This will enable researchers to further identify individual distribution and movement demographics, along with the fertility and reproductive patterns of specific females. The collection and analysis of this data is critical to monitoring the status of South Africa’s southern right whale population. It is also key to identifying and understanding possible causes for the drop in recorded southern rights in the last few years – as well the heartening upturn in numbers this year. There is no better place to watch whales from the shore than along the Cape Whale Coast, which begins just an hour from Cape Town at Rooiels and stretches along an incredibly scenic route to Gansbaai. 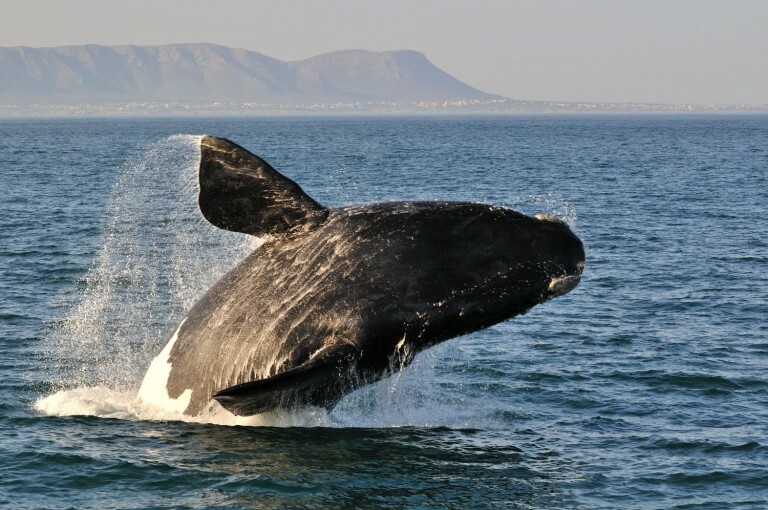 At its centre is Hermanus, the global Mecca for land-based viewing of these magnificent mammals. From late June to November the South African coast becomes the playground of hundreds of southern right whales that swim up from the Antarctic before the cold season to socialise, mate and calf in warmer waters. This is a migration ritual that has happened for thousands of years, though southern right numbers plunged dramatically between the 18th to 20th centuries, when they were deemed the ‘right’ whales to hunt, a name which has stuck with them through to contemporary times. Fortunately, figures have risen slowly but steadily since 1935, when the species became internationally protected. In 1997, there were an estimated 7500 southern rights left in the southern hemisphere: Only 10% of the original population but a vast improvement on past figures. Like humans, whales are warm-blooded, air-breathing mammals that have a high level of intelligence and form strong social bonds. Studies have shown they have quick learning abilities and highly developed cerebral areas that, in humans, are key components in interpersonal processes. Under normal circumstances, whales are gentle towards both their peers and human beings and show infinite tenderness towards their young. They travel in groups called pods that display close mutual bonds and communicate with each other by way of haunting cries and squeaks, as well as ultrasonic sounds – inaudible to the human ear – thought to be used primarily for echolocation* purposes. Once hunted in large numbers for their oil-rich blubber, southern right whales have been internationally protected by 1935, and South Africa’s population has been steadily increasing at a rate of roughly 7% per year since protection was instituted. Humpbacks have been protected since 1966 and stocks have recovered significantly since, with stocks now back to approximately 65% of their original counts.